Other comics | The Captain Britain fans' page and blog. 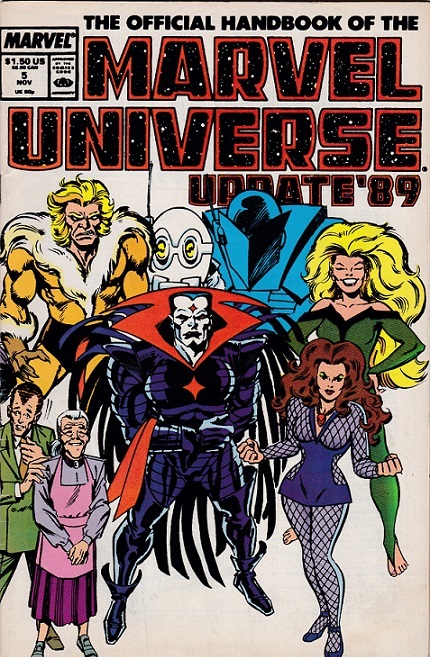 The article lurks behind a Ron Frenz cover. The scan hasn’t come out great as the comic is quite old, so I’ll summarize the three best odd facts about the article below. 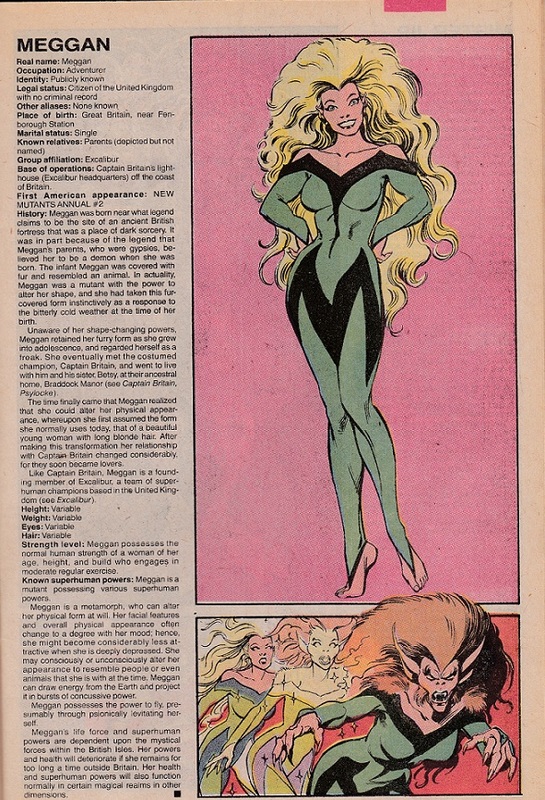 The first oddity is apparently Meggan’s first UK appearance isn’t worth talking about as the page lists her American debut in New Mutants annual 2. Why her UK debut isn’t worth listing escapes me, maybe Marvel were on one of their periodic falling outs with Alan Moore, or was it because the UK comic in question wasn’t available except as a back issue? Who Knows? Secondly the article states that apparently Meggan is only as powerful as a woman of the same age who engages in moderate regular exercise. Hmmm, I don’t think so as this 1998 Excalibur issue 3 panel shows. 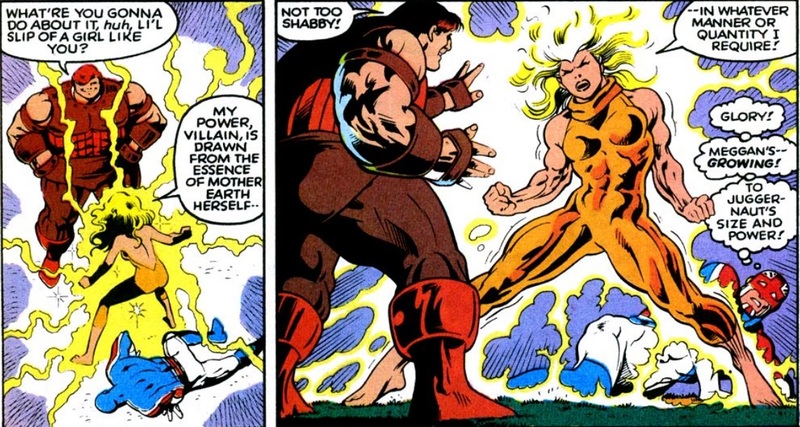 Last but not least the article tells us it seems Meggan will lose her powers and health if she remains for too long a time outside the British Isles, but she won’t have the same problem in magical realms or dimensions. I can’t put my hand on any comic where this happened to Meggan, Captain Britain briefly suffered the problem until it was quickly forgotten. Despite the mild inaccuracies with the article it’s still a great little read, with nice Alan Davis art, and it makes me want to read more Marvel updates so it’s surely had the effect Marvel wanted. My Meggan research will continue but I think I will source something more accurate, maybe WIkipedia? For more inaccurate Marvel facts why not read my thoughts on bizarre Captain Britain trading cards here and here. Captain Britain across the multiverse part 2. Earlier this week I published a list of five superheroes from across the vast multiverse of comics that I felt had influenced or been influenced by Captain Britain. Today I look at my final five choices and some runners-up, part one can be read here. Rock star, superhero and slayer of elder gods Grant Morrison’s Zenith has something for everyone. 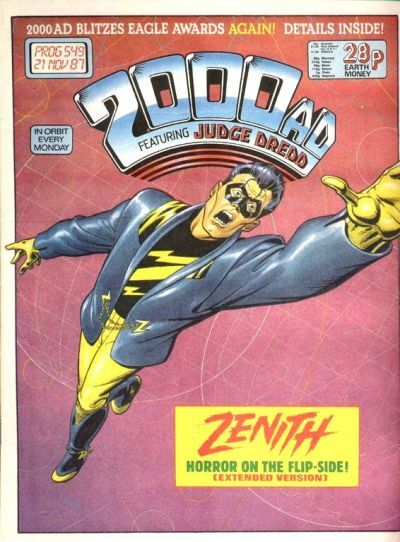 Created for UK weekly sci-fi mag 2000AD in 1987 Zenith’s legal shenanigans were only sorted out last year allowing fans to finally see his adventures reprinted in an affordable format. Zenith was a mix of slack behaviour, superhero style action and Morrison using him and the cast to make attacks on the Conservative party. Interestingly enough another hero with Captain Britain similarities named Maximan turns up in a flashback set during the war, sadly he is quickly dispatched by his Nazi counterpart Masterman. 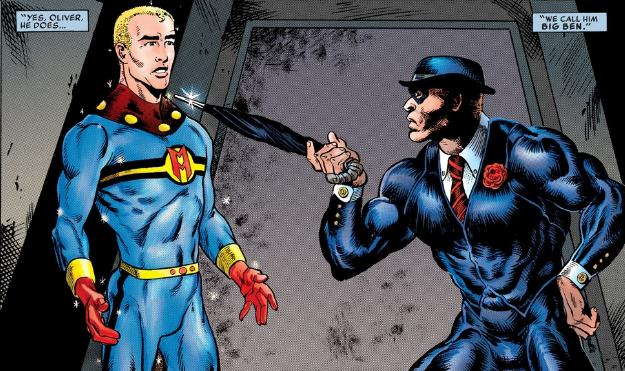 The self-styled Man with no Time for Crime Big Ben was a supporting character in Alan Moore’s Miracleman run – interestingly like Zenith only now out of legal obscurity and with affordable reprints. Big Ben was a deluded superhero who saw all his adventures in a comic book style, sadly he had his arse well and truly kicked by Miracleman. But still you have to admire his style, the bowler, brolly and natty suit combo clearly showing where his loyalties lie. 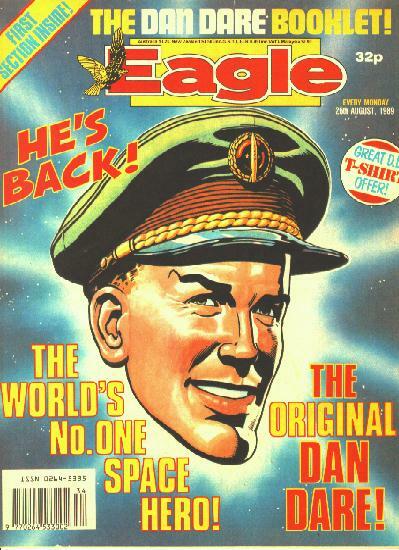 Dan Dare the squared jawed, clean-cut astronaut and all round hero debuted in UK magazine Eagle in 1950 and is still going strong today. Reimagined by Grant Morrison and Garth Ennis, Dan has always been a popular hero and he still has new adventures printed three times a month in the fan publication Spaceship Away, showing you can’t keep a good hero down. Dan was famous for his stiff upper lip, never breaking his word, being an ace pilot and roundly thrashing his arch-enemy the Mekon every time they met. Washed up on the shores of Scotland Garth’s nationality is suspect, but as Superman is often referred to as American as his rocket crashed there I’d like to think we can apply this theory of nationality to Garth. 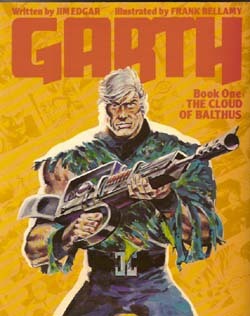 Garth debuted in UK newspaper the Mirror in 1943 and began his interdimensional quest to thwart evildoers and right wrongs which continued up until 1997. During the Seventies and Eighties when I read Garth every day in my dad’s newspaper I certainly remember him as a daring hero who battled evil often with the help of a nubile lady who would have difficulty keeping her top on. 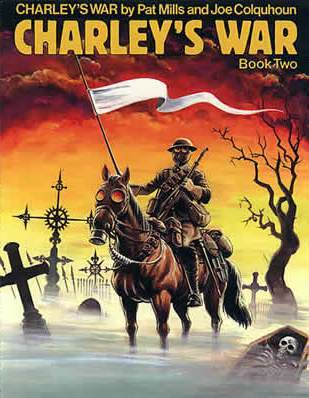 Last on my list in World War One veteran Charley Bourne from the definitive war comic book tale Charley’s War published by Battle comics from 1979 to 1985. Charley had no superpowers except some might say luck, perseverance and bravery, and his story is often hailed as the best war comic ever written and is now collected for all to enjoy. So I hope you have enjoyed my look across the multiverse of comics at Captain Britain’s ancestors and “family” , here’s the runner-up list of more heroes I could have discussed if I’d had the time. I’ve no doubt there’s many more UK influenced superheroes out there and if I’ve missed any off please feel free to drop them into the comments section below. 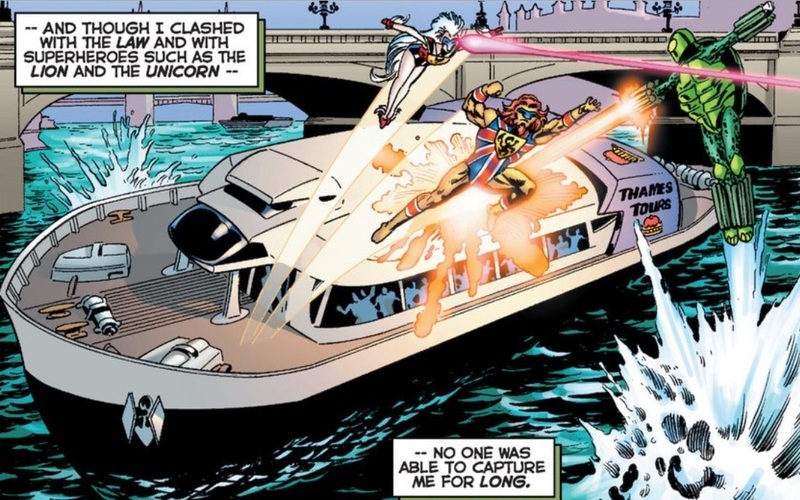 Captain Britain is a great hero, but he’s not that unique in the superhero world. Why? Well, if you take a look across the many different comics universes that exist there are plenty of heroes who have influenced Captain Britain or been influenced by him. So I thought it would be interesting to cast an eye across this multiverse of superheroes and see what other UK heroes we could find. 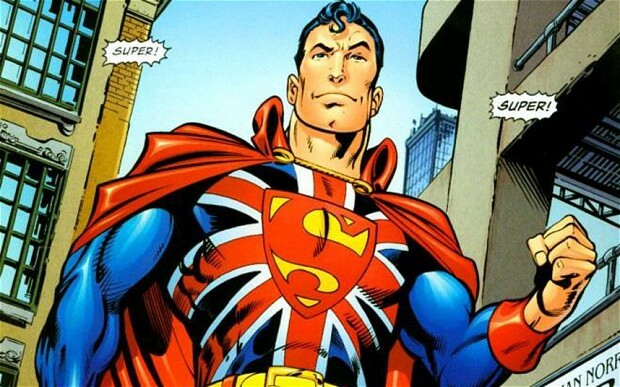 Let’s start with Marvel Comic’s Union Jack, who on first examination bears a very close resemblance to Cap from his name to his costume, however if Captain Britain is comparable on a super power level to Superman then Union Jack is more like Batman. 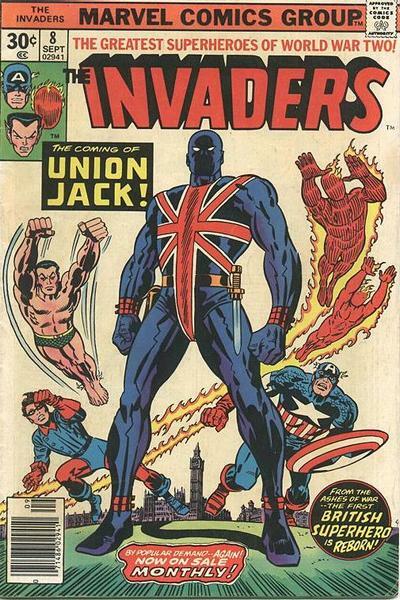 Unlike Batman though many heroes have worn the Union Jack costume one who even fought alongside Captain Britain in the Knights of Pendragon series. Talking of Superman, in the Elseworlds graphic novel entitled True Brit by John Cleese and Kim Howard Johnson we get to see what might have happened if Superman had crashed in England and been raised as a UK citizen. The book is loved by some as a unique take on Superman, and hated by others due to what they feel are the outdated stereotypes it portrays. If I can ever overcome my dislike of the majority of Superman stories I might read it some day and give you my opinion. 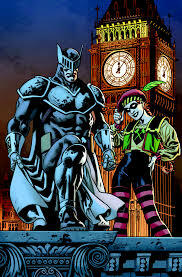 DC Comic’s Knight and Squire are their UK version of Batman and Robin, whose modern versions were created by Grant Morrison – more from him later – based on old DC characters. The UK writer influence doesn’t end there as Captain Britain scribe Paul Cornell wrote a magnificent mini series about them, which should be still available. Sadly after the DC Universe reboot Knight was killed off, but still when has death ever been permanent in comics. I don’t have much information on Kurt Busiek’s UK heroes Lion and the Unicorn from his Astro City series other than the picture above. However outside of DC and Marvel Busiek’s creator owned ongoing series is to me one of the best superhero universes ever created, and if you have never read any my advice is get stuck in immediately and make up for all that lost time. 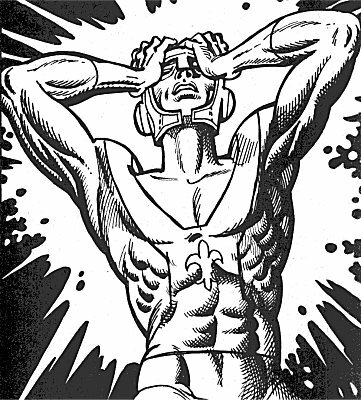 Marvel’s Captain Granbretan was created by Grant Morrison for a backup text piece in Captain Britain weekly. The story sees Paul Peltier find a strange suit on Darkmoor which he hopes to exploit to make money as a superhero, sadly the suit is sentient and kills Peltier and carries on utilizing his body to fight crime. However the suit soon consumes all of its owners remains so is forced to return to Darkmoor hoping someone will find it again soon. Join me soon for more UK influenced superheroes from the obscure to the mega popular all of who have in my opinion influenced or been influenced by Captain Britain. Until then to keep up with all the posts on this blog you can follow The Captain Britain Blog on Facebook, on Pinterest, or subscribe to this blog by entering your email in the link top right.